The 1967 animated version of The Jungle Book holds a special place in the hearts of Disney fans. It was the last animated film produced by Walt Disney himself (although it was released months after his death) Its script and general direction were heavily influenced by Disney, who insisted on lightening the more somber tone of the original screenplay and using well known vocal talents like Phil Harris and Louis Prima, who essentially played themselves. After its release, Disney animated films went into a downward creative and financial spiral that continued for two decades, until the release of The Little Mermaid revived the studio. Nearly a half century later, Disney has remade The Jungle Book, and, in doing so, the studio has taken a big gamble. Instead of producing another animated film, the studio opted for live action, although, in this case, the term live action is a bit of a misnomer. 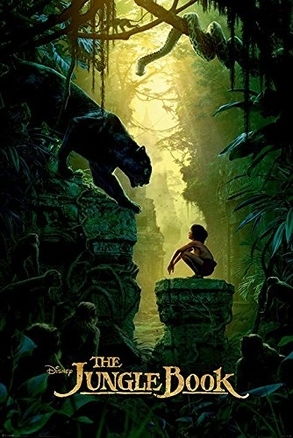 Rather than attempt to film the movie with actual wild animals, as in Disney’s 1994 version of the film, the studio instead opted to cast a child actor, Neel Sethi, as Mowgli, the book’s hero, and surround him with CGI creatures living in a CGI jungle. Amazingly, the animals look and act strikingly real, so much so that viewers may think the movie was filmed in the depths of South America or India rather than in an animation studio in Los Angeles. Screenwriter Justin Marks and director Jon Favreau have gone back to Rudyard Kipling’s original short stories to set the tone, although several plot points from the 1967 version remain. Mowgli has been raised by a pack of wolves after being orphaned as a baby and has been taught the ways of the jungle by the panther Bagheera (voiced by Ben Kingsley) and the alpha wolf Akela (Giancarlo Esposito). However, the pack’s peace is shattered when the rogue tiger Shere Khan (Idris Elba) discovers Mowgli by the communal watering hole. Khan and Mowgli’s father fought years earlier, resulting in the man’s death and Khan being scarred, so he wants revenge. The Law of the Jungle forbids him from attacking at the watering hole, but he threatens to kill Mowgli later. Rather than put his family and friends in danger, Mowgli leaves. Fortunately, Mowgli isn’t alone for long. A bear named Baloo (Bill Murray) rescues Mowgli when the child is nearly killed after being hypnotized by Kaa (Scarlett Johannson), a very large snake. Baloo and Mowgli become friends, but again Mowgli leaves when he realizes Baloo can’t protect him from Shere Khan. After an encounter with a King Louie, a giant orangutan (Christopher Walken), Mowgli finally returns home, intending to use the one thing Shere Khan fears—the “red flower” (fire)—against the tiger. Rudyard Kipling wrote what we now consider The Jungle Book as a series of short allegorical stories, only three of which featured the child Mowgli. The script that Walt Disney oversaw combined elements of the Kipling stories with traditional Disney slapstick, and the examination of what makes man superior to the various animals, which featured prominently in the Kipling stories, went on the back burner. Instead, the idea of returning Mowgli to his fellow humans is about reuniting families. King Louie wasn’t in the Kipling stories, but Disney wanted to add some more singing talent to the cast. Kaa, who was actually a hero in Kipling’s story, became a bumbling doofus who exemplified his portrayer, character actor Sterling Holloway, who specialized in playing bumbling doofuses. Even Shere Khan, silkily voiced by George Sanders, was only rarely scary, due to the omnipresence of more friendly creatures. The 1994 Disney version of the movie was more of a straightforward adventure, with well-known adult actors (including Jason Scott Lee as a grown Mowgli) featuring more prominently than the actual animals, which weren’t provided with voices and whose skills were limited to the stunts they could perform. Clever editing and photography gave the illusion of interaction between humans and animals, but those techniques had their limits in 1994. What Favreau has done in the current Jungle Book is to create essentially a completely animated story (with the exception of Sethi). However, it’s a story that, with the aid of excellent CGI graphics and sound work, looks, sounds, and feels real. The effects people here don’t just go back and insert animated bears and tigers in outdoor settings; they create the settings as well. And, for the most part, the animals move and react as actual animals would, not as animated super-creature that routinely defy the laws of nature. Credit should also go to young Sethi, who takes on a nearly impossible task for a child actor, namely, to realistically interact with thin air. When Favreau’s techniques work, and they do work most of the time, the effect is stunning, and this is one film that’s definitely enhanced by 3D. Shere Khan and Kaa are truly menacing (although the way Kaa is dispatched is somewhat of a letdown). Audiences will usually feel as if they’re in the middle of a wild animal safari ride. But on those occasions in which the animals act more human, usually in moments of the type of physical slapstick that permeated the 1967 film, Favreau’s carefully set-up illusion is shattered. When Baloo tries to climb a rock wall or engage in the type of slapstick that worked in 1967, the result looks more like the Country Bears Jamboree. The worst offender is Christopher Walken’s King Louie. For some bizarre reason, rather than make him look like an actual orangutan, Louie is about 20 feet tall, hides in the ruins of a temple, and channels Marlon Brando as Colonel Kurtz in Apocalypse Now. True, he does get to do a lively rendition of “I Wanna Be Like You,” but this would have probably worked better if he’d more closely resembled Clyde from Clint Eastwoods Which Way movies. One thing Favreau and the producers have borrowed from Walt Disney is star vocal casting of recognizable actors. Baloo’s physical humor isn’t that successfull, but Bill Murray’s dry one-liners are. And no one can provide quiet moral authority the way Ben Kingsley does. But the best character of all is Shere Khan, a rare villain with dignity and principles who, under different circumstances, might have been a hero. The Jungle Book could have used some tighter editing, as there is just too much back and forth about what Mowgli should do, and I got the distinct impression that screenwriter Marks used this as an excuse to be able to shoehorn in as many bits as possible form the 1967 version, including Bill Murray’s rendition of “Bare Necessities.” As a result, any real moral message in the movie is muddled. However, for what it sets out to do, creating an exciting adventure in which a young boy realistically appears to befriend and confront a variety of wild animals, The Jungle Book is unsurpassed. I’ve often felt that the real strength of CGI animation is not to make the completely impossible look real (it still doesn’t), but rather to stretch reality “just so” much farther. Jon Favreau and his crew have done just that.